When we heard the name of the new Star Trek movie was Beyond, we assumed that was little more than a buzzword that made the title sound cool. It turns out, there was a little more to it than that. When Star Trek Beyond hits theaters this summer it won’t simply be showing off cool science fiction technology. It will also be using some pretty cool technology to screen the film. Beyond will use Barco’s Escape projection system to create a three-screen panoramic image of the final frontier. Barco has been showing off its Escape technology, which projects images not only in front of you, but on two additional screens on the sides of the theater, for a couple of years now. Previously, the biggest theatrical releases to use the technology has been the Maze Runner movies. 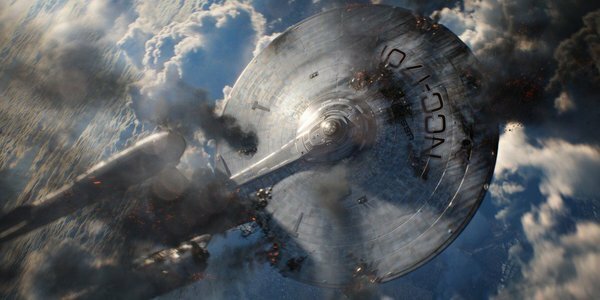 However, now the tech will be used for its largest production to date, Justin Lin’s Star Trek Beyond. Bad Robot is reportedly remastering the film so that certain segments of it take advantage of all three screens. As much as 20 minutes or more of the total film will take advantage of the additional space. Ben Rosenblatt, the head of visual effects for Bad Robot told The Hollywood Reporter how the additional space could be utilized for the film. While last year was a record year for the box office, theaters are not seeing great increases in the number of people who actually go to the movies. In an attempt to combat this, theaters are always looking for new ways to entice people into theaters, giving them experiences that they can’t get at home. Utilizing multiple screens is one way of providing an image that you simply can’t get anywhere else. While IMAX goes for creating a single giant screen, there’s something to be said for expanding the viewing area laterally, as well. The idea of seeing a space battle that’s actually taking place all around us certainly sounds appealing. Of course, as with all new technology, the ability to see Star Trek Beyond in the Escape format isn’t necessarily that easy. Barco only expects to have about 50 theaters outfitted in time for Beyond’s July 22 release. Although, they expect to have 100 theaters by the end of the year and as many as 3,000 in the next three to five years. Have you had a chance to see a movie in the Escape format? What did you think? Will you be seeking out a theater to check out Star Trek Beyond in this revolutionary new format?